Easter is just around the corner, believe it or not. I love the work that goes into Easter traditions — pies that take days to make, like the Neapolitan pastiera and the abundant use of spring eggs like in Tuscan Easter schiacciata. 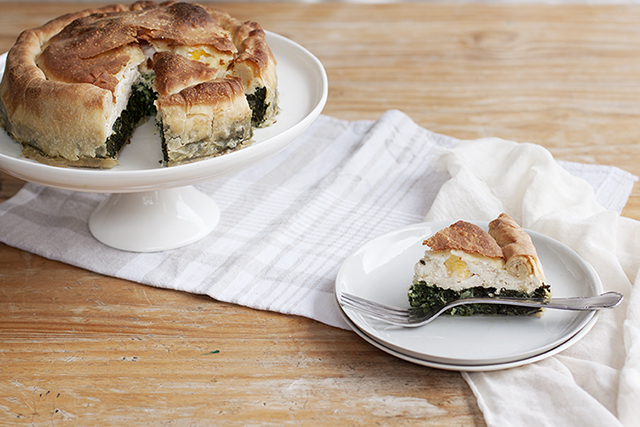 This torta pasqualina or Easter pie (pasqua means ‘Easter’ in Italian), made with fine layers of dough and filled with chard, eggs and ricotta, is no exception. 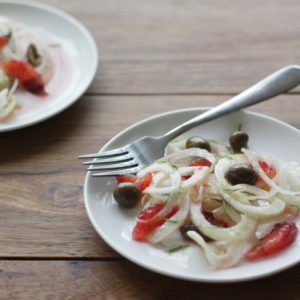 One of Liguria’s iconic dishes (next to pesto of course), this recipe has roots that can be traced back to the fifteenth or sixteenth century. Made with the season’s best offerings – fresh herbs, green vegetables such as chard (or artichokes or even foraged wild greens – a version that is particular to the town of Ventimiglia on the far west of the region) and plenty of eggs. The dough is similar to that of Liguria’s paper-thin focaccia di recco, made of just flour, water and a touch of olive oil, it is rolled and stretched until almost transparent then layered to create the base and the top. The original torta pasqualina, it is said, called for 33 layers of dough to represent the 33 years of Christ – most recipes today will call for a total of four, two on the bottom and two on top, for a lovely flaky crust but one that’s easier to make at home. 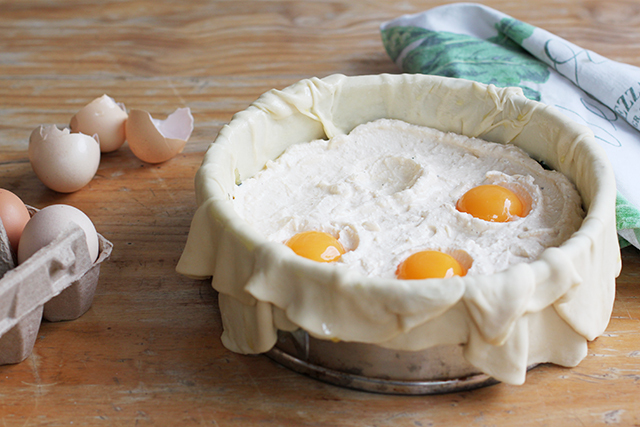 It may look daunting – the layers of dough, the layers of filling, the yolks cracked into the top, the number of steps. But it’s actually a rather simple preparation and doesn’t take long. Also all the elements of this dish can be prepared ahead and then it’s just assembling before going in the oven that takes a bit of patience. This is the most traditional way to make torta pasqualina but there are many other ways you can approach this pie – corner cutting, if you must. I don’t think it will deter from the flavour as much as from tradition. You could skip the dough and use store bought puff pastry or filo pastry instead but I do highly recommend trying out this dough and this technique – it’s rather amazing. You’ll see what I mean when you try it. 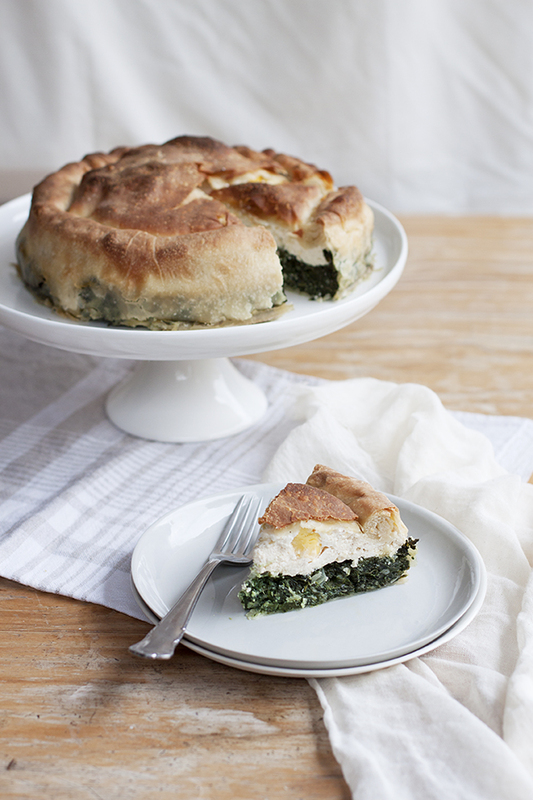 You can combine the ricotta and chard mixture together for one filling rather than layers. You can leave out the cracked yolks over the top. Or you can make them whole eggs, if you don’t like separating. And you don’t have to stick to four eggs cracked over the top — some recipes use seven! If you can’t get chard/silverbeet, you can use spinach or any other greens instead. You could also try artichokes or using a filling of half artichokes, half chard. The cheese is an important part of the dish and this is traditionally made with Genovese prescinseua, a fresh, tangy curd with the consistency somewhere between thick yoghurt and ricotta. It’s rare to find it outside of Liguria so some recipes suggest adding some thick natural yoghurt to ricotta to obtain a similar flavour and consistency when you can’t get prescinseua. With the leftover dough that gets trimmed off, you can roll it out and make decorations for the top of the pie, if you want to get really festive! 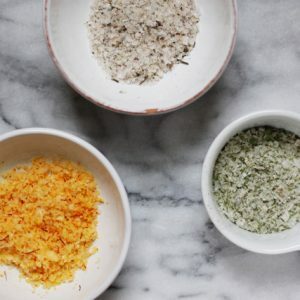 Place the flour, salt and oil in a bowl and add water, little by little until you have a dough that is neither dry nor sticky. You may need to add a bit more water, you may not need it all, so I suggest doing this by hand or at least adding the water bit by bit so you can see how the dough behaves. Once it comes together into a dough, knead it on a lightly floured surface about 5-10 minutes, or until the dough is smooth and elastic (it should bounce back when poked). Wrap in plastic wrap and let rest for at least 1 hour (you can also prepare this the night before and leave it overnight in the fridge). Cook the silverbeet (chard) until tender, about 5-7 minutes. Remove from the water, drain, let cool slightly then chop finely. Squeeze again to remove as much water as possible. In a large pan, saute the onion in 2 tablespoons olive oil until soft and translucent. Add the spinach and toss to combine with the onion, cooking a further 2 minutes. Season with salt and pepper, add the fresh marjoram leaves and set aside to cool. When cool, combine 2 beaten eggs and a third of the Parmesan with the chard mixture and set aside until needed. In a bowl, combine the ricotta, 2 eggs, a third of the Parmesan, nutmeg and season with salt and pepper. Beat until well combined. Set aside in the fridge until needed. Brush olive oil lightly over a cake tin with a removable base (about 23-25cm diameter is fine but larger sizes work too). Cut the dough into 4 equal portions. Roll one out at a time, keeping the others well covered with a tea towel or plastic wrap. On a large, lightly floured surface, roll the first ball of dough until very thin. You may even need to pick it up and stretch it between your hands, gently – you should be able to see your fingers through the other side. 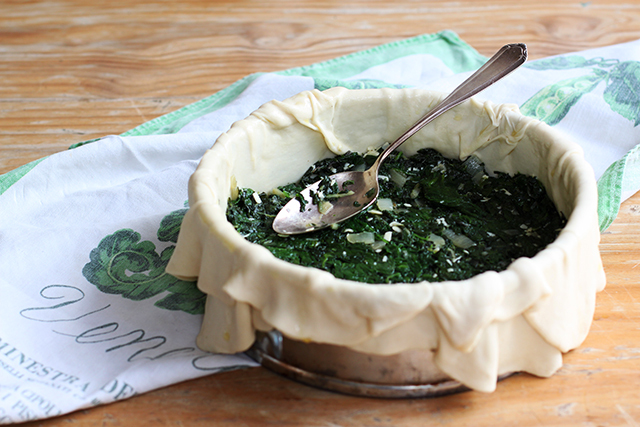 Fill the pie base with the chard mixture, smoothing over the top with the back of a spoon. Next, layer over the ricotta mixture, smoothing over the top with the back of a spoon. Then, with the help of a spoon, make four round indents over the surface of the ricotta to fit 4 egg yolks. Crack the eggs, separating the whites from the yolks. Place the yolks in the indents in the ricotta and the whites in a small bowl. Whisk the whites together with a fork and pour over about half of the whites to make an even layer that just covers the ricotta. Sprinkle over the rest of the Parmesan. Roll out the third ball of dough as before. Gently lay it over the top of the pie and brush lightly with olive oil. Roll out the last ball of dough and lay it over the top. Trim the dough overhang, leaving about an inch (2 ½ cm) from the edge of the top of the pie, and roll the trim down until it reaches the top of the pie. Brush the top with olive oil and then bake for about 50 minutes at 180°C. Serve warm or even cold – this also makes a great portable picnic dish! A few tips: Make sure the greens are well-drained and squeezed — too much water can make the base excessively soggy. Also, it helps to make sure you have an oven that bakes well from the bottom. If you’re not sure or you suspect it doesn’t, you may want to start baking on the lower shelf and move it up a shelf about halfway through baking. It’s also a good idea to let the tart sit for about 20 minutes before slicing into it to allow all the juices to settle a bit. Emiko, the dough sounds rather similar to phyllo pastry. Is it? Love this idea. I have been hesitant in making dough that needs to be stretched so thin. But this post is making me want to give it a go! It’s very similar indeed but this is a typically Ligurian preparation! In fact, you could substitute store bough filo pastry if you aren’t sure about making this dough — but I would REALLY recommend giving it a go! Use bakers/bread flour for its strength (it makes this dough very, very elastic so you can stretch it really thin) and you should love it! The result is somewhere between puff pastry and filo pastry so store bought versions aren’t exactly the same. Beautiful and surely delicious! I’d love to make it for Easter (I’m bookmarking your recipe). Thanks Rosa! Someone just gave me another nice idea for this — individual pies! It’s so soft and wonderful to work with — and also amazingly elastic and forgiving. This pie looks absolutely mouthwatering and amazing! I bet 1 kg chard is a huge amount! Do you recommend to try with spinach too? I absolutely love the Italian vegetable pies and I think I will give this one a try even though the dough looks a little scary to me! What a beautiful looking pie. I love the vibrant egg yolks in it. 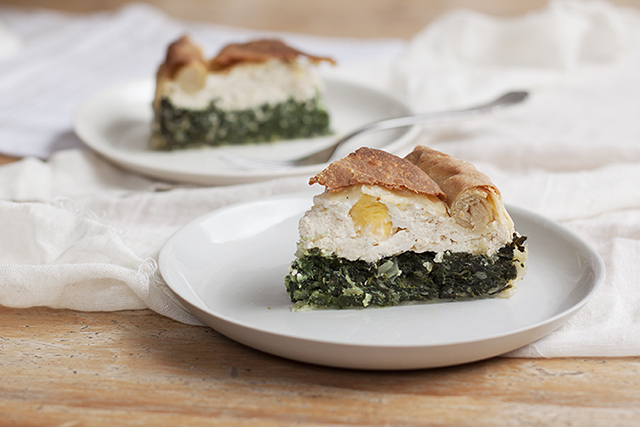 I grew up eating spanakopita, which I love, but this is the far sexier version. 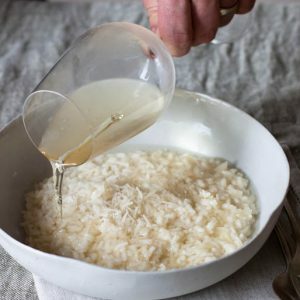 I love this recipe and love the photos! I’ve just stumbled upon your corner of the web by way of Instagram. So very lovely! I can already tell this will become a frequent stopover of mine. I adore green pies so will need to try this one. Perhaps not in time for Easter but we shall see! Do! 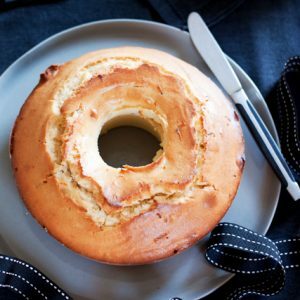 It’s a wonderful pastry and quite fun to prepare, not to mention delicious. I’m confused by the last bit of instructions for trimming and rolling the dough. Can’t picture what you mean. Hi Virginia! Traditionally the excess dough is simply rolled in towards the pie — see the final photos of the finished pie and notice the rolled edge of the pie in the photos of it cut and hopefully that helps! I’ve just got this in the oven, thanks for this recipe. The flour was way too much and I have about half of the pastry left over, for the next one perhaps. It freezes well if you want to keep it for another day!